Rápido y fácil de instalar y configurar. Menos cuellos de botella y menos puntos de fallo. 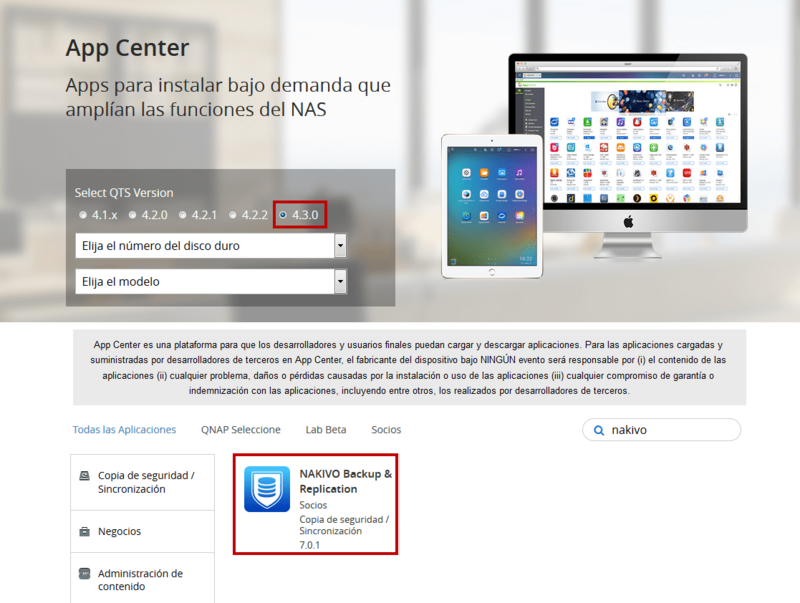 Desde la web de QNAP, en el App Center. Desde la misma NAS, en el menú aplicaciones. Creo que solo esta disponible a partir de Nas con Firmware 4.3.0., y de momento no dice que modelos son compatibles. Solo esta disponible para arquitectura X86, descargas e instalas. Espero que en los siguientes días vaya recibiendo mas datos y novedades sobre esta nueva característica. 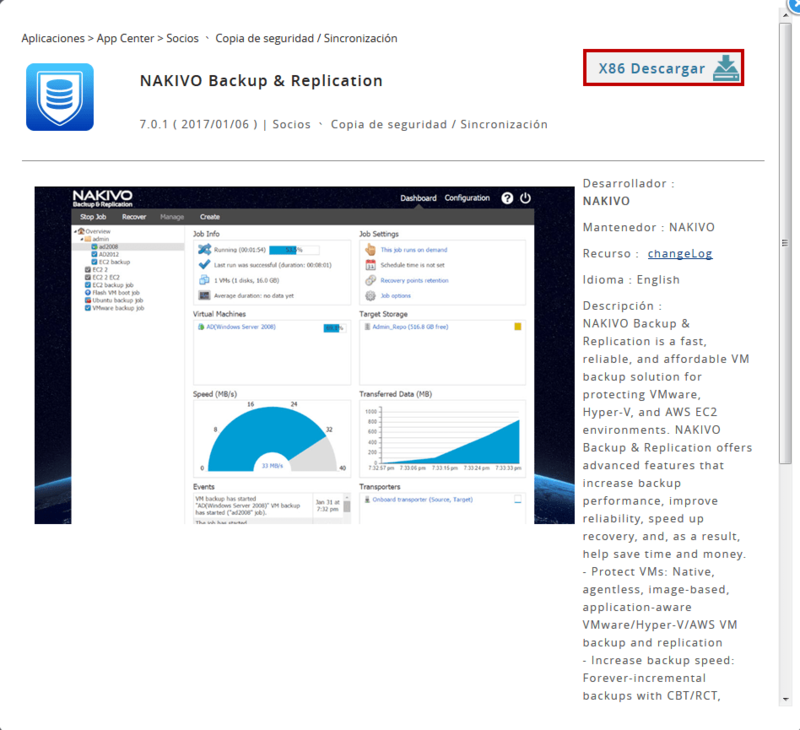 Aquí os dejo la nota en Ingles sobre el productor Nakivo Backup and Replication v7 sobre Nas QNAP. NAKIVO VM backup appliances based on QNAP NAS combine backup hardware, backup software, backup storage, and data deduplication in a single device. This setup frees up virtual infrastructure resources previously used for backup and results in a smaller footprint and less maintenance. Compared to purpose-build backup appliances, the combination of NAKIVO Backup & Replication and QNAP NAS is up to 5X more affordable, while delivering the same or higher levels of performance and reliability. NAKIVO VM backup appliances based on QNAP NAS also deliver higher VM backup speed when compared to VM-based backup solutions. This is because backup data is written directly to the NAS disks, bypassing network protocols such as NFS and CIFS. NAKIVO VM backup appliance based on QNAP NAS can boost VM backup performance by up to 2X. NAKIVO VM backup appliances based on QNAP NAS separate virtual infrastructure and backup software, which improves reliability and ensures that recovery can be performed even if a portion of a virtual infrastructure is unavailable. NAKIVO VM backup appliances based on QNAP NAS can be deployed onsite or offsite – even in locations with no virtual infrastructure – and can be used to store primary and secondary VM backups. NAKIVO VM backup appliances based on QNAP NAS provides all components that are required for operational and disaster recovery: hardware to run restores, backup data, and backup software. • Faster recovery: Instant recovery of VMs, files, Exchange objects, Active Directory objects, instant disaster recovery with VM replicas.